As her 7th-grade students bury their noses in the book “Parrot in the Oven,” teacher Elizabeth Carrillo asks a comprehension question that is written in two languages on an overhead projector. Carrillo, who’s teaching a lesson on inferences, has written the definition of the word on the overhead, with a formula—in English and Spanish—for drawing inferences by combining what the text states with their prior knowledge. Carrillo’s class at Sawyer Elementary illustrates one of the challenges to educating English-language learners: ensuring that students become literate in their native language—something that experts say is important for their success in English and other subjects—and learn sufficient English skills before they enter the middle grades, a critical transition point because of the increasingly difficult academic content that students are expected to master in English. Research shows that these long-term bilingual students are more likely to fall behind their peers in high school. Julia Gwynne, who is working on a study of English-language learners for the University of Chicago Consortium on School Research, says that Latino students who are long-term English-language learners—those who were placed in the program before 6th grade and were still in it in 9th grade—have worse odds of succeeding in high school compared to their peers who transitioned out several years earlier. “They have the lowest course grades, highest number of course failures, the highest number of absences, and the lowest on-track rates,” Gwynne says. The absences add up to nearly two weeks of school per semester. If current trends in population and achievement continue, up to one-quarter of all U.S. students may fail to become proficient enough in English to succeed in school before they graduate—or worse, drop out—of high school, says Arizona State University bilingual education expert Eugene García, who is vice president for education partnerships at the school. At Sawyer, a handful of students in each of Carrillo’s five 7th-grade classes are still in the bilingual program; the rest are former English learners and general education students. But Carrillo points out that her bilingual education coursework did little to help prepare her to teach them. The classes focused mostly on the philosophy and theory of bilingual education, and not enough on practical teaching strategies. “You have so many different challenges with students—some of them coming in at different ages and with different background knowledge,” Carrillo says. Many middle-schoolers struggle because they did not develop adequate literacy skills in their primary language. This can happen when principals and administrators don’t understand language acquisition or the value of bilingual education, says Judy Yturriago, who directed Evanston’s bilingual and early childhood programs for five years and is the president of the Illinois Association for Multilingual Multicultural Education. However, a few of Peck’s middle-grades bilingual students—many of them in special education—still need extra help. But the overcrowded school, which has 1,600 students, lacks adequate space for pull-out instruction and must accommodate students in hallways and closets. Fourth-grade teacher Christine Benson, a Chicago Teaching Fellows member who works at Patrick Henry Elementary, says that she sometimes sees her students caught between two languages—not fluent in either. For instance, during a recent lesson, not only did many students lack academic vocabulary words like “patella,” several did not even know the word “knee” in Spanish. Such a scenario can set students up for disaster as they head into the middle grades with language skills that are far below grade level. Experts say there are two other keys: rigorous English instruction and strong academic content. Summer school and extended school day opportunities, though expensive, can help such students catch up, he says. Even in these settings, challenging academics are key. “Don’t just re-do what you did in 6th grade,” he says. García says that if students don’t become English-proficient in the middle grades, there is sometimes little that can be done to help them become proficient in academic English. Diane August, a researcher at the Center for Applied Linguistics, advocates having middle-grades teachers use both English and content area standards in their lesson designs, making sure to hit both at the same time. For example: A lesson about the Gettysburg Address might need to include extra background knowledge on the U.S. Civil War (if students are new arrivals to the country). Students can read the address in both languages to pick out cognates, words that are similar in both English and Spanish. Margin notes can explain what the most challenging words mean. And teachers can provide students with fill-in-the-blank “sentence frames” to help them answer comprehension questions in complete sentences. Jennifer Himmel, another researcher from the center, says that vocabulary can be a significant stumbling block in the middle grades. Too often, teachers focus on highly technical words instead of more common academic words, the “connective tissue” of language. And once instruction has transitioned out of students’ native language, teachers may no longer point out cognates—words that are the same in Spanish and English—which are often a gateway to more advanced vocabulary. 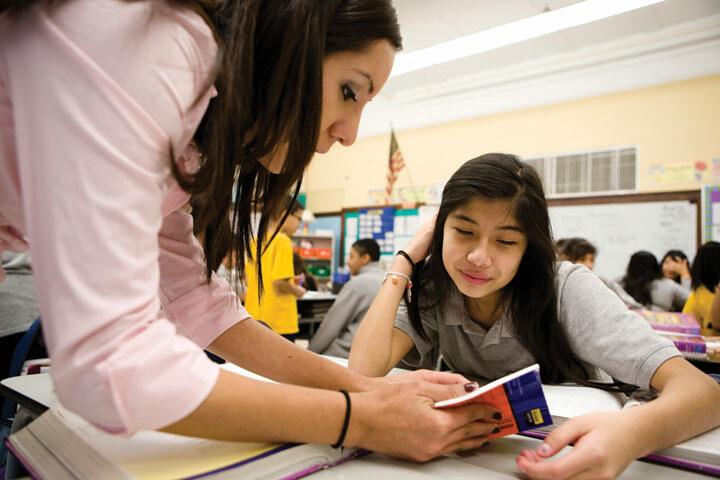 What’s more, the level of vocabulary required increases greatly just as students hit 4th grade—which is often when instruction is transitioned from some native language and some English classes, to English only. Cognizant of these issues, Edwards Elementary Principal Judith Sauri has embarked on an experiment: making all her school’s students, many of whom are current and former English-language learners, take Spanish foreign-language classes once they hit the middle grades. It helps meet the requirements of the school’s International Baccalaureate Middle Years Program, and it also adds up to extra literacy time for her students. “My kids are lost in 4th and 5th grade because there’s no Spanish,” Sauri says, including students who have tested out of the bilingual program. Bringing Spanish back in the middle grades helps them gain a foothold. Illinois is one of only a few states to require that non-English-speaking students be taught in their native language, with an increasing percentage of instruction in English as students gain proficiency. But a proposal from a state task force would essentially ease the native-language requirement (see story on page 11). Now, under the helm of CEO Jean-Claude Brizard, there are signs that the district will begin to push for a dual-language approach. It’s a strategy that is gaining traction across the country. A dual-language program combines academic instruction in a student’s native language and in English, so students are taught in both languages, says Leo Gómez, a University of Texas-Pan American professor of bilingual-bicultural education who serves on the board of the National Association for Bilingual Education. Students learn academics “and they have much more success as they continue in school,” he adds. In California, a 1998 law that eliminated bilingual education and put the focus on English immersion has had negative results, with the achievement of English-language learners plummeting, says Gómez. Now the state is considering a dual-language strategy. Texas has embraced it too, and now almost one of every two schools in the state has a dual-language program, he notes. Texas, along with New York and New Mexico, are leaders in adopting the model. Many schools in Chicago are interested in dual language, according to CPS spokesman Frank Shuftan, and CPS is in the process of adopting official quality review criteria for dual-language programs, as well as a handbook, resource guides, and planning tools for new programs. “Many schools have expressed interest to explore this possibility, or have reached out to actively start the planning process,” he notes. CPS is also encouraging schools to increase programs that help students develop their native language, because of “the positive academic, social and cultural benefits for students who maintain higher levels of language and literacy development in their first language while learning a second language,” Shuftan says. Recent hiring is another sign of the shift. Olivia Mulcahy, previously in charge of dual-language programs, now heads the entire Department of Language and Cultural Education. And some of the 19 school networks have hired new bilingual instructional leaders, whose job is to restructure and improve programs. High-quality dual-language programs will not spring up overnight at every school that enrolls ELL students. But the model could make headway with the biggest problem Carrillo encounters: students who are not literate in their native language or in English. Carrillo explains that one contributing factor is the push, by some schools and teachers, to teach young children only in English before they know how to read or write in their native language—something that would not occur in a true dual-language program. Intern Lindsay Abbassian contributed to this report. Tell us what you think. Leave a comment below, or email rharris@catalyst-chicago.org.